This topic describes how to configure an MG interface for implementing the communication between the MA5600T/MA5603T/MA5608T (AG) and the MGC. The MA5600T/MA5603T/MA5608T communicates with the MGC through either the H. 248 or the MGCP protocol. One MA5600T/MA5603T/MA5608T can run only one protocol. One MA5600T/MA5603T/MA5608T supports up to eight MG interfaces. Each MG interface can be configured with the attributes (such as authentication and ringing mapping) independently. This topic describes how to specify the upstream VLAN interface for the media stream and the signaling flow, and how to configure the IP addresses of the Layer 3 interface. These IP addresses are the sources of the media and signaling IP address pools. Multiple IP addresses can be configured for the same VLAN Layer 3 interface. Only one IP address functions as the primary address, and other IP addresses function as the secondary addresses. Step 1: Run the vlan command to add an upstream VLAN for the media stream and the signaling flow. Step 2: Run the port vlan command to add the upstream ports to the VLAN. Step 3: Configure the IP addresses of the VLAN Layer 3 interface. 1. Run the interface vlanif command to enter the Layer 3 interface of the upstream VLAN for the media stream and the signaling flow. 2. Run the ip address command to configure the IP addresses of the Layer 3 interface. Step 4: Run the display interface vlanif command to check whether the IP addresses of the Layer 3 interface. The media IP address pool defines all media IP addresses that can be used by the AG, and the signaling IP address pool defines all signaling IP addresses that can be used by the AG. Step 1: Run the voip command to enter the VoIP mode. Step 2: Configure the media IP address pool. 1. Run the ip address media command to add the media IP address to the media IP address pool.The media IP address needs to be selected from the IP addresses of the Layer 3 interface of the media and signaling upstream VLAN. 2. Run the display ip address media command to check whether the media IP address pool. Step 3: Configure the signaling IP address pool. 1. Run the ip address signaling command to add the signaling IP address to the signaling IP address pool. The signaling IP address needs to be selected from the IP addresses of the Layer 3 interface of the media and signaling upstream VLAN. 2. 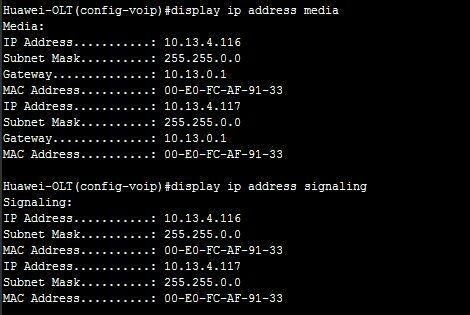 Run the display ip address signaling command to check whether the signaling IP address pool. This topic describes how to add an MG interface, through which the MA5600T/MA5603T/MA5608T can communicate with the MGC. One MA5600T/MA5603T/MA5608T supports up to eight MG interfaces. Each MG interface can be configured with the interface attributes independently. The configuration of the attributes of an MG interface is valid only to the MG interface. Add an MG interface that supports H.248. 1. Run the display protocol support command to query the current system protocol. – If the current system protocol is H.248, go to Step 8. – If the current system protocol is MGCP, proceed to Step 2. 2. Run the display if-mgcp all command to query whether an MG interface that supports MGCP exists. – If such an MG interface does not exist, go to Step 5. – If such an MG interface exists, proceed to Step 3. 3. Delete all user data of this MG interface, and then run the shutdown(mgcp) command to disable the MG interface. 4. Run the undo interface mgcp command to delete the MG interface. 5. Run the protocol support command to change the system protocol to H.248. 6. Run the save command to save the configuration data, and then run the reboot system command to restart the system to make the new configuration data take effect. 7. After the system is restarted, log in to the system, and enter the global config mode. 8. Run the interface h248 command to add an MG interface that supports H.248. 9. Run the if-h248 attribute command to configure the attributes of the MG interface. 10. Run the display if-h248 attribute command to check whether the attributes of the MG interface. Add an MG interface that supports MGCP. – If the current system protocol is MGCP, go to Step 8. – If the current system protocol is H.248, proceed to Step 2. 2. Run the display if-h248 all command to query whether an MG interface that supports H.248 exists. 3. Delete all user data of this MG interface, and then run the shutdown(h248) command to disable the MG interface. 4. Run the undo interface h248 command to delete the MG interface. 5. Run the protocol support command to change the system protocol to MGCP. 8. Run the interface mgcp command to add an MG interface that supports MGCP. 9. Run the if-mgcp attribute command to configure the attributes of the MG interface. 10. Run the display if-mgcp attribute command to check whether the attributes of the MG interface. After the system is restarted, re-log in to the system. Enabling an MG interface is to reset an MG interface to make the MG interface register with the MGC (or to make the modified attributes of the MG interface take effect) after the configuration of the MG interface is complete, so that the MG interface can work in the normal state. Enable the MG interface that adopts the H.248 protocol. 1. Run the interface h248 command to enter the H.248 mode. 2. Run the reset coldstart command to enable the MG interface. 3. Run the quit command to return to the global config mode, and then run the display if-h248 all command to check whether the MG interface is in the normal state. Enable the MG interface that adopts the MGCP protocol. 1. Run the interface mgcp command to enter the MGCP mode. 2. Run the reset command to enable the MG interface. 3. Run the quit command to return to the global config mode, and then run the display if-mgcp all command to check whether the MG interface is in the normal state. After an MG interface is configured, you can add plain old telephone service (POTS) users on the MG interface to implement the VoIP service. This topic describes how to configure the PSTN user data (the same as the corresponding data on the MGC) on the MG interface to provide the POTS terminal with the access to the network for VoIP service. The POTS service board must be inserted into the planned slot, and the RUN ALM LED of the board must be green and must be on for 1s and off for 1s repeatedly. Step 1: In the global config mode, run the board confirm command to confirm the service board. Step 2: Add a PSTN user. 1. In the global config mode, run the esl user command to enter the ESL user mode. 2. Run the mgpstnuser add or mgpstnuser batadd command to add a PSTN user or add PSTN users in batches. 3. Run the display mgpstnuser command to check whether the PSTN user. Step 3: (Optional) Configure the attributes of the PSTN user. The attributes of a PSTN user need to be configured when the default settings are not consistent with the actual application. 1. Run the mgpstnuser attribute set or mgpstnuser attribute batset command to configure the attributes of the PSTN user. 2. Run the display mgpstnuser attribute command to check whether the attributes of the PSTN user.